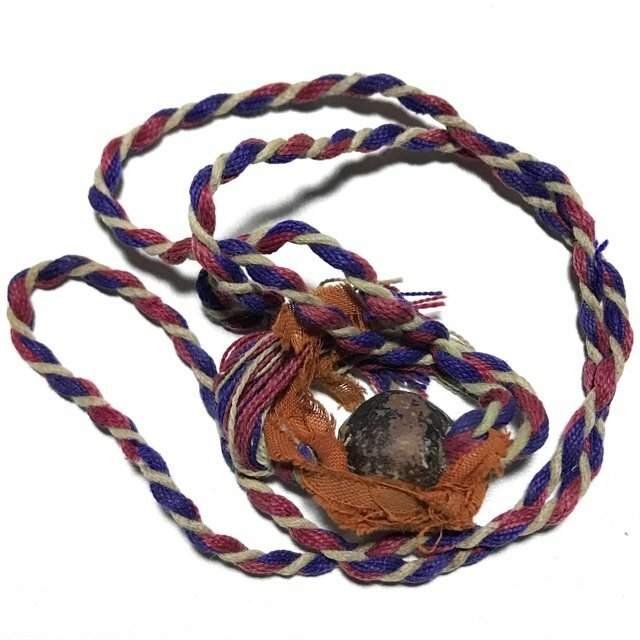 A very rare old Look Om Chan Hmak chewed betel and areca nut amulet, with a strip of Civara Monks Robe attached to a red white and blue Chueak Tong Chart (Thai Flag) cord, for wearing as a necklace. This Look Om is unusual (Nork Pim), in the sense that it is bare and threaded onto a necklace, with Civara Robe, whereas most of Luang Por Tob's Look Om were almost always wrapped in cord with a pendant hoop. A very rare original amulet from the legendary Luang Por Tob, of Wat Chon Daen (Wat Chang Phueak). Estimated to have been made during the middle Era of Luang Por Tob's trajectory, between 2480 - 2500 BE, the Look Om is highly renowned for Maha Lap Lucky Fortunes, and its powerful Kong Grapan Chadtri, Klaew Klaad, and Maha Ud Protective Power.